Many people are confused between the concept of oil production costs and the concept of fiscal breakeven, for countries that rely on oil production to finance their government budgets. 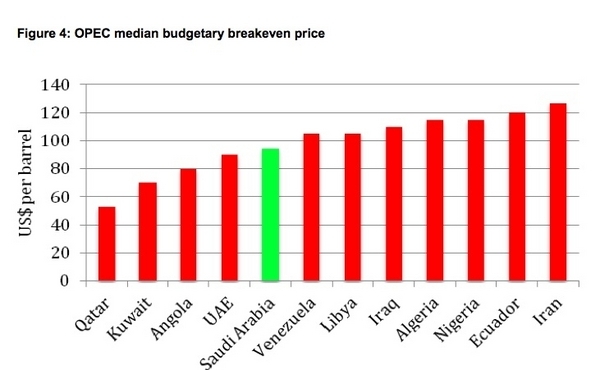 The graphic below looks at fiscal breakeven for a number of oil states belonging to OPEC. This is how much each nation must charge for a barrel of oil to support its government budget. For Russia -- not a member of OPEC -- estimates for fiscal breakeven vary between $125 and $150 per barrel. "A key outcome of the Arab uprisings has been a significant increase in the prices needed by the producers to manage their fiscal position. This is a serious indictment of the producers' failure to diversify their economies away from a dependence on oil revenues over the past 20 years. Keep in mind that for the US, Canada, most of Europe, etc. the concept of fiscal breakeven does not apply, since these nations do not depend upon oil sales to finance their governments. The concept of upstream production costs, of course, still applies. The reason that war is inevitable, is that nations such as Iran, Venezuela, and perhaps Russia, are losing money at current oil prices. And yet, oil production is set to increase from North America to Iraq to Brazil to the far East. Russia is struggling to produce as much oil as it can, using an infrastructure that should have been replaced over 20 years ago. Red Queen Russia is faced with the need to lure more competent international oil companies into the country to upgrade badly deteriorated oil & gas infrastructure. But Russia has a bad reputation of stealing foreign investment outright -- without apology. Getting insurance to do business in Russia can be difficult, for that reason, and due to rampant organised crime, violence, and extortion. Is there any wonder why Russia is egging on Iran to build nuclear weapons, or supporting Syria's bloody suppression of a popular uprising? Russia thrives on the geopolitical risk premium built into the price of oil -- between $15 and $30 per barrel in some markets. Russia seeks to push that risk premium even higher, to avoid being forced to curtail its ambitious military and nuclear upgrades. The same dynamic is at work in the thinking of the dictatorships of Iran, Venezuela, and other oil tyrannies. These despots may understand that wars often grow out of control and consume those who sought to gain from them. But some of them may see no other way out of their fiscal trap. For Europe, North America, Oceania, and East Asia, the lesson is clear: Develop your own energy resources. Conventional and unconventional oil & gas, coal, nuclear, bitumens, kerogens, gas hydrates, biomass, geothermal . . . . Everything must be on the table -- except for the intermittent unreliables which are more destructive than constructive. It is time for the more advanced nations to decouple themselves from the incredibly unstable OPEC / Russian oil & gas producers -- as much as possible. That is the only way to prevent the inevitable war from spreading out of control.